Maine Historical Society seeks an Historic Housekeeper for the Wadsworth-Longfellow House. This role is fundamental to the operation of the House, MHS’ most significant collection. The role’s foremost responsibility is to perform general housekeeping tasks to ensure that the House looks its best for visitors. Methodical housekeeping is an essential part of the preservation of the building, and therefore the Historic Housekeeper must work carefully, and thoughtfully at all times. Historic housekeeping is not like regular housekeeping. It is a method of preserving a historic structure, and part of MHS’ broader collection management program. This contracted position is ideal for those looking to broaden their museum, preservation and collections experience. The schedule is flexible, but housekeeping must take place outside of public hours (10am-5pm). The hours each season (April -Nov) are estimated at approximately 45 hours. Download job description and application requirements. 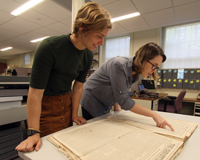 Whether you're new to Portland or have been here a while, consider getting involved at Maine Historical Society as a way of learning more about your city's past, exploring its great cultural offerings, and connecting with like-minded folks. Volunteering at Maine Historical Society allows you to build your resume while engaging in your community, and giving back. Volunteers are an integral part of all aspects of MHS—we couldn't do it without you! 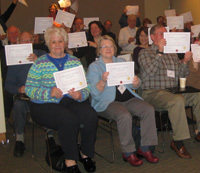 More than 100 people contribute their talents to help us fulfill our mission. We have a wide variety of opportunities available year-round—in Visitor Services, the Library, with digital projects, collection initiatives, school groups, within museum galleries, at fundraisers and more. What piques your interest and aligns with your skills? Check out the options below and complete the online volunteer application form. We look forward to welcoming you aboard! In general, MHS internships and volunteer positions operate seasonally, following a college semester pattern: Fall, Spring, and Summer. Wadsworth-Longfellow House positions operate May through October. Positions for each season are generally filled two to three months in advance. If applying close to, or mid-season, please also consider listing your availability for the following season. However, we encourage applicants to reach out throughout the year, as new projects and initiatives are always underway. All volunteer positions take place at MHS's campus located at 485–489 Congress Street in Portland and primarily during regular business hours, although some evenings and weekend opportunities may be available for special events. Assignments for volunteers might include assisting with general organizational tasks, entering program information into online events calendars, staffing donor events, and other similar responsibilities. Some tasks can be done from home if preferred. Success of the Brown Research Library depends heavily on our supportive volunteer community. Volunteer duties available in the library include processing collections, cataloging, data entry, indexing, inventorying collections, digitization, transcription and conducting general historical and genealogical research. In general, library volunteer positions are seasonal and operate on a Winter (Jan-Apr), Summer (May-Aug) and Fall (Sept-Dec) schedule, and commence during public hours. We welcome applications year round, but positions are usually filled two to three months prior to the seasonal start date. If you are interested in volunteering at the Brown Research Library, please complete the online application form. If you are interested in helping with digitization or cataloging of collections on Maine Memory Network, indicate this on the volunteer form. Online application form. Task for volunteers in the Finance and Administration Department might include assisting with filing and other organizational tasks, data entry, answering phones and making calls, and other similar responsibilities. Online application form. Volunteers in the museum help to document and care for the collection by cataloging, research, and preparing items for storage. They may also assist with specific research and collections projects. Training is provided but experience is certainly helpful and appreciated. Online application form. Opportunities within the Education Department include the following. Unless otherwise noted, please complete the online application form to be considered for a volunteer position. Wadsworth-Longfellow House or Portland History Walking Trail Docent. Many of our house tours are led by docents during the May-October open season, and at other select times throughout the year. All Walking Trail tours are led by docents, June-Columbus Day. Tours may be for the general public or school groups. If you are interested in applying to be a docent, you have two options. Complete the online application form and our Visitor Services Manager will set up an appointment to speak with you about one-on-one training to become a docent, which involves learning about Portland and Wadsworth-Longfellow family history, shadowing seasoned guides, customer service and tour guide skills, and safety and security standards. We invite applicants year-round! Participate in the next Portland History Docent training program, a collaborative effort between eight historic sites in Portland. While this is an excellent, multi-session program, and many PHD students do become MHS docents, we do not require participation in the program. Museum Exhibition Greeter/Attendant. Some of our gallery spaces on campus require greeters and attendants to direct visitors, answer basic questions about the exhibitions, and monitor the space. These opportunities are generally in 3-4 hour shifts. School Program Assistant. We work with many school groups throughout the year and need assistance overseeing students in the galleries and while they are doing activities, as well as prepping activity materials and room set-up for their visits. We serve elementary, middle, and high school students. Volunteers working with school groups must submit to a background check. Public Programs/Special Events Assistant. Occasionally we need volunteers to help out with book talks, lectures, workshops, and other special events. This might involve set-up and break-down of the space, greetings attendees, and assisting with speakers. 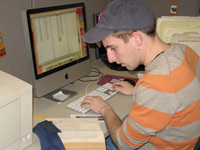 Internships for high school, college, and graduate students are available in the Brown Research Library, and Museum, Digital Projects, and Education departments. Internships are defined as supervised practical training for a specified amount of time or number of hours. All internships are unpaid, unless otherwise noted. Projects will vary according to individual needs and goals of the student and MHS. Traditionally, internships are offered in the fall, spring, or summer but other arrangements may be available. Internships for college credit are available; however it is the responsibility of the applicant to make prior arrangements with their educational institution. Prospective interns should be advised that space is limited and positions are awarded on a first come, first serve basis. If you are interested in an internship with the Maine Historical Society, please fill out this online application form. These assignments involve working in indoor and outdoor settings at MHS's main campus and in downtown Portland. This internship aims to build a knowledge of museum operation and customer service standards, as well as object-based interpretation and storytelling in a museum setting. Schedules are to be arranged with individual interns through the Public Engagement Department and are flexible but may include weekend hours. Internships begin in late April-early May and end in August. College or graduate credit may be available through your home campus. To apply, please submit a resume and cover letter to Kathleen Neumann at kneumann@mainehistory.org. See full internship description. PHD 2018 begins on February 22 and runs through April 26. Fill out and application and sign-up! Portland's History Docents Program (PHD) is a collaborative effort by Greater Portland Landmarks, Maine Historical Society, Tate House Museum, Victoria Mansion, the Maine Narrow Gauge Railroad and Museum, the Fifth Maine Regiment Museum, Eastern Cemetery, and Spring Point Lighthouse. Each spring, these organizations join forces to provide a nine-week training program for new prospective volunteer guides at each organization's respective museum site. Several weeks of lively and informative talks and presentations take place at MHS, combined with site visits to each partnering organization. Upon graduation, PHD participants become eligible to volunteer at the site(s) of their choice, and training at those sites is scheduled on an individual basis. Graduates are asked to commit to a year of volunteer time. At MHS, docents facilitate programming for the Wadsworth-Longfellow House, conduct the Old Port Walking Tour, and assist with visiting educational groups. Cost is $30, or $20 with a valid student I.D. Applications for the program are processed through Greater Portland Landmarks beginning. For more information on the PHD program or to fill out an application, visit the Portland History Docent website.